This was between the fourth seeds, Cedric de la Chaise & Carine Valarche and the second seeds Greg Lim & Marjan Denis. 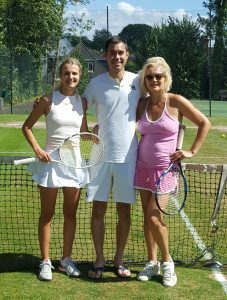 Cedric and Carine had knocked out the top seeds Tim Simpson & Anais Reding in the previous round. The match was expected to be tight. Cedric’s strategy was to rely on Carine not to make unforced errors, but not to play aggressively, while he expected to cover the rest of the court and either hit winners outright or set them up for his or Carine’s next shot. However, in the first set there were possibly signs of fatigue from Cedric after his previous singles semi-final. He made a few unforced errors when there was a possibility of hitting a winner. Carine did not have her eye in fully, and Cedric and Carine never got fully going. Carine struggled throughout to get her first serves in and to hold on to her serve. By contrast, Greg and Marjan were much more solid. Greg and Marjan won the set 6-2. In the second set Cedric was able to to step up his game, but not to eliminate the errors completely. The pair equalised at 3 all, but found themselves losing 3-5 until Greg lost his serve to give them 5 all. Then came Marjan’s serve, and Greg, in particular, having mostly played well throughout, started to feel the pressure and dumped two volleys into the net from the left hand side of the court, the second of which should have been relatively straightforward. This eventually resulted in Marjan being broken. Unfortunately, in the next game, Carine could not get her first serves in or deliver a good enough second serve to get into the point properly. Thus, at 6 all, matters rested on the set tie break. Cedric and Carine had the mini-break until Carine had to serve, but she could not take either point. On Greg’s serve Cedric had a shot for a winner to even matters up, but could not get it right, and Greg and Marjan were then able to take the tie-break 7-4 for a 6-2 7-67-4 victory. Had Cedric not had to play the previous singles semi-final, and thus been more likely to play at his best, the pair could have won. Greg and, particularly, Marjan generally played solidly. Carine generally held her own, except, perhaps, on the serve. 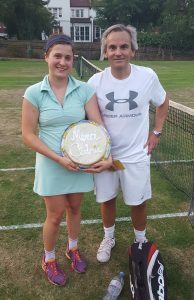 She also hit some great winners at the net and some great service returns, although Greg managed to ace her a few times on the forehand side. She also surprised Cedric on a few occasions. On one point he was at the net with Carine at the back and the opponents lobbed over him three times, to opposite corners of the court. Carine chased down all three and won the point for her side. You should have seen the look on Cedric’s face. After the match, to mark Cedric’s acceptance of Carine’s invitation to join her in the mixed, Carine presented him with a specially baked thank-you cake! 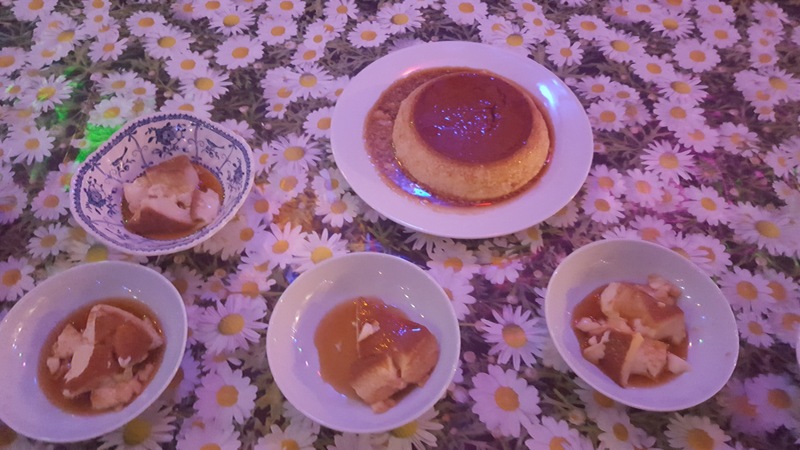 Rachael Gangji provided the traditional delicious Thursday fish pie Gourmet Dinner, and Lara provided a selection of tempting puddings. In addition to the mixed final the two men’s singles semi-finals were played. On grass court 1, Ed Fitzgerald, fresh from playing out of his skin to beat the second seed Greg Lim, had to contend with the third seed Marcio Sugui. 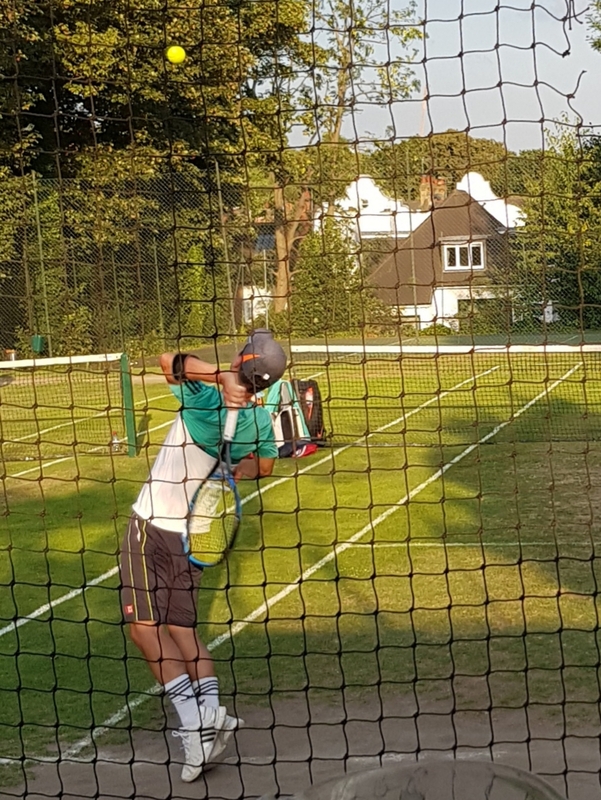 Ed continued with his power game and hit a number of winners on both services and groundstrokes. Although Marco denied it, Ed felt that Marcio made only two unforced errors, though Ed himself made rather more. However Marcio does have excellent placement and control of spins, and this did induce a significant number of errors from Ed. As a result, Marcio won the first set 6-1 and the second 6-2. 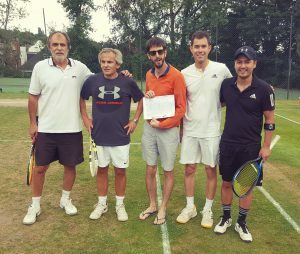 On centre court, the fifth seed, Philip Reid‘s previously smooth progress towards the final was somewhat disrupted by having to play an actual match against the top seed Cedric de la Chaise. Previously Philip had had a bye in the first round and two walk-overs in the next two rounds. As Philip is very tall, he has a penetrating serve which can set him up for a volley, and can also hit some powerful ground strokes. Cedric can play very consistently. Rather than going for it, Philip played well within himself in the first set, which to a large extent played to Cedric’s strengths. This did not look like the right game plan and Cedric won the first set 6-1. However, in the second set, after going two down, Philip took his power game to Cedric. 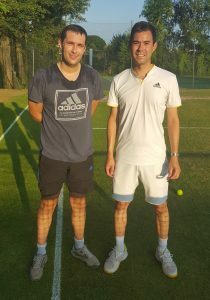 This did work better, as Philip hit winners and was able to induce errors and short balls from Cedric, but because Philip started late and was not able to apply this game plan consistently, Cedric took the match 6-1 6-3. There was a big discussion about Elena Valarche’s chances against Andra Marinescu in Saturday’s ladies’ singles final. 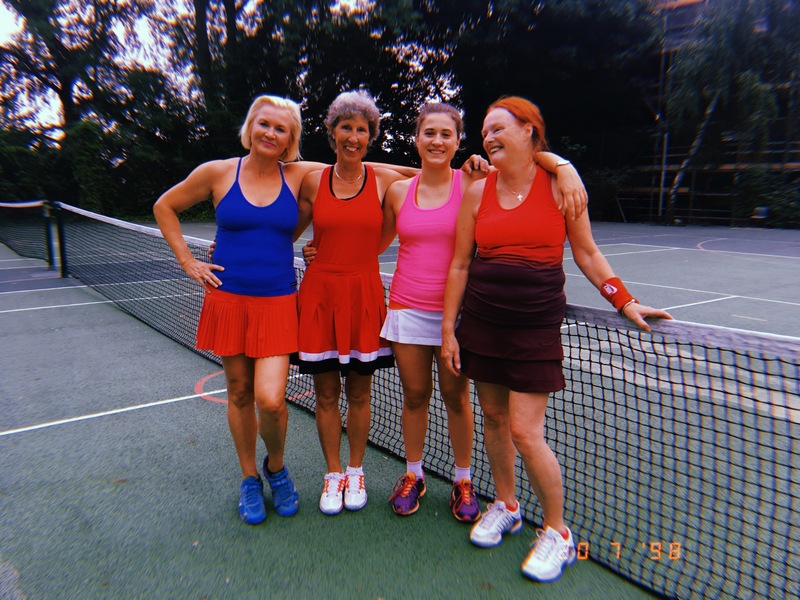 Andra was playing for West Heath over the winter season, but in the summer season has been playing in the Cumberland ladies second team, which is a higher standard. When asked about the match, Elena herself drew a pair of goggles around her eyes with her hands (implying a double bagel). 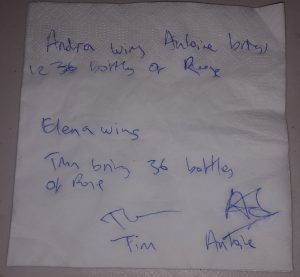 Tim Simpson tackled Antoine Valarche about it, which resulted in the bet pictured, drawn up on a serviette. The concensus was that Antoine had got the worst of the bet. 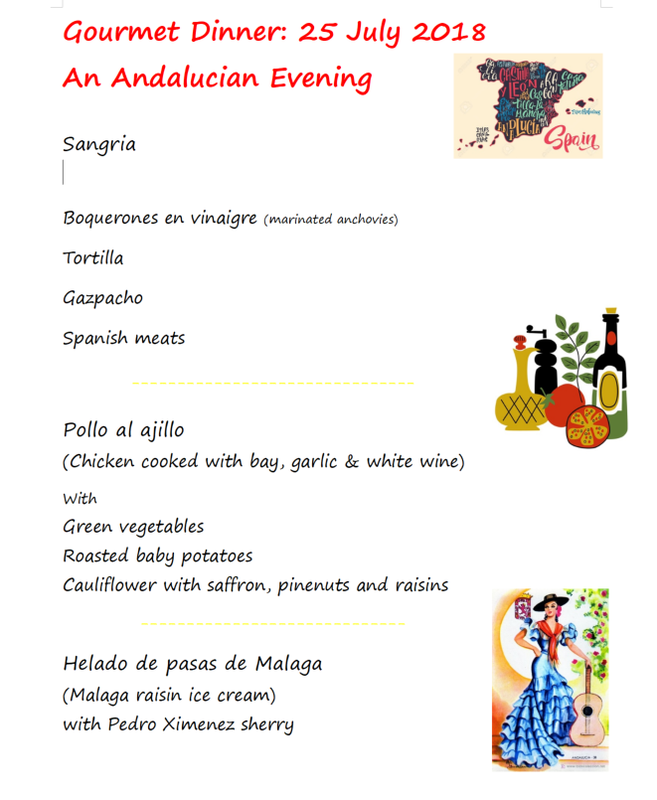 The Gourmet Dinner last night was a comprehensive, eclectic and delicious Spanish meal prepared by Lesley. See the menu in the post below. 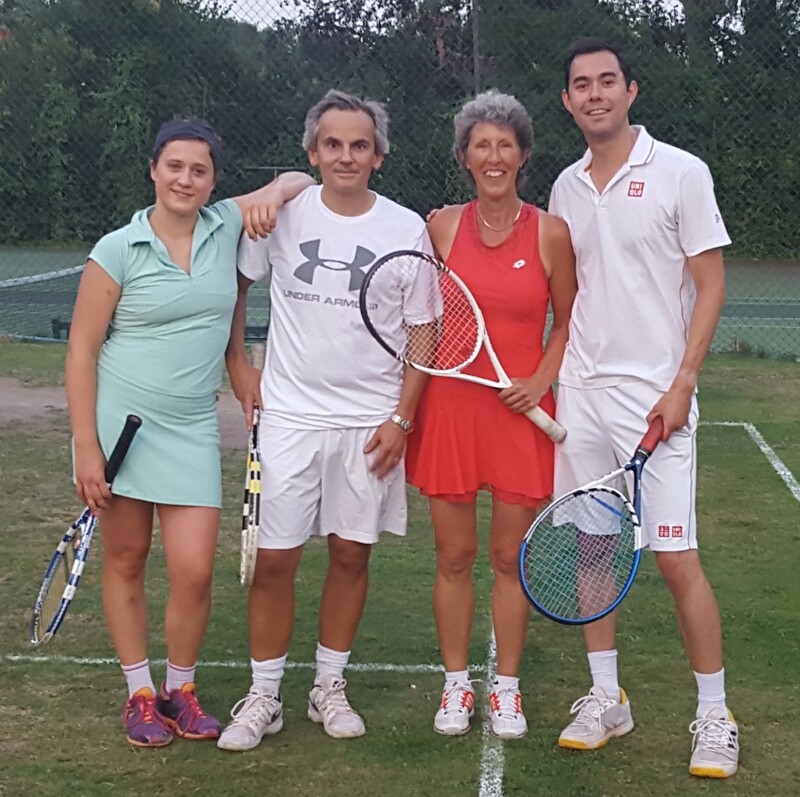 There were two men’s doubles and a ladies singles match played. 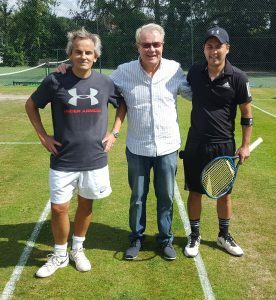 On grass court 1 the unseeded Ed Fitzgerald & James McKenzie played against the top seeds Cedric de la Chaise & Lajos Szucs. Although Ed can send down booming serves, and James can swing out his leftie serve, they struggled to hold serve. The rest of Ed’s game relies more on power than consistency, but the top seeds are used to dealing with thhis. Cedric and Lajos had too much consistency and power and they were able to turn this into pressure. Cedric in particular is very fast around the court and Lajos made few unforced errors to back him up. The top seeds won 6-1 6-2. 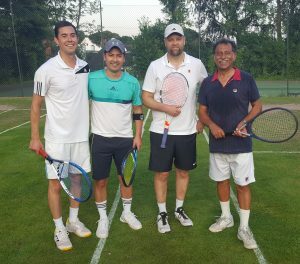 On the centre grass court the spectators were expecting the second seeds Dan Oakley & Sultan Gangji to force an eventual win over the second seeds Greg Lim & Marcio Sugui. 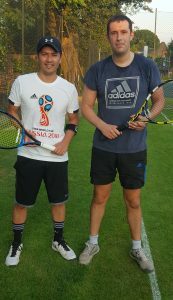 However, after his defeat at the hands of the unseeded Ed Fitzgerald in the men’s singles quarter fina, Greg had a point to prove, and Marcio is a strong leftie with enough service variety to make it difficult for the returner (see super back-scatch position in photo on right from Susan Grossman), so they were both up for it. 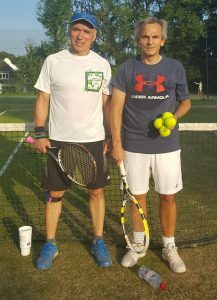 By contrast, Sultan and Dan didn’t seem to be playing at their best – possibly two nights of Gourmet Dinners taking a little more of a toll on the older contingent? 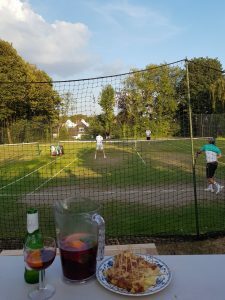 However, there was some good tennis played all round, and a number of very entertaining points to divert the crowd’s attention away from the Sangria and nibbles (photo courtesy of Susan Grossman). The first set didn’t go according to plan, with Greg and Marcio breaking and take it 6-3. The second set was even less of a success for Dan and Sultan, enabling Greg and Marcio to take the match 6-3 6-2. Greg and Marcio thus face Cedric and Lajos in the final on Saturday. On grass court 3, Marjan Denis and Andra Marinescu faced each other for a place in the ladies’ singles final. 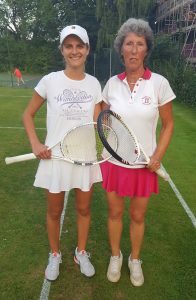 Although Andra was playing for West Heath ladies’ first team last year, this year she is in the Cumberland ladies second team, so is obviously a strong player, but Marjan was not playing particularly well, particularly on the low balls which perhaps resulted from the greener (and less bouncy) grass coverage on court three compared with courts one and two. Andra won 6-0 6-0. Moira Duncan was the Gourmet Chef for this evening, cooking a delicious chicken and spinach curry. This was followed by a mango pudding. The entertainment kicked off with two men’s singles. Grass court one hosted Ed Fitzgerald vs Greg Lim, the second seed. According to Greg, Ed has never beaten him. Ed says he has beaten him twice, among lots of defeats. Greg wasn’t playing particularly well, but Ed was playing out of his skin. Both made a number of unforced errors, but Ed’s booming serve, long-armed reach and lethal forehand also provided him with a number of winners. Greg hit fewer winners and seemed to be having particular difficulty in getting his first serve in. It was all very tight, with fine margins and a number of breaks of serve. Ed won the first set 6-3 with a couple of net service breaks. The second set was more even, with breaks traded evenly until 4 all. There was then a slightly peculiar game on Ed’s serve which, given that Ed kicked off with a double fault, according to both Sultan and I, did not seem to have enough points in it for Ed to win it, though both players seemed to agree that Ed had, in fact, won it. Greg could not then hold his serve, Ed taking the match 6-3 6-4. Given the way Ed played, his mother should be proud of him! So that was one upset for this evening. On Centre Court, Eugene Berlin was hoping to get at least a game from Cedric de la Chaise. Though Eugene played some great points this proved difficult. Cedric played a medium-paced game, looking to win on consistency while preserving energy for his subsequent mixed match. Eugene got to 30 points in some games, but couldn’t meet his target. Cedric won with a combination of placement, winners off short balls and occasional unforced errors from Eugene. 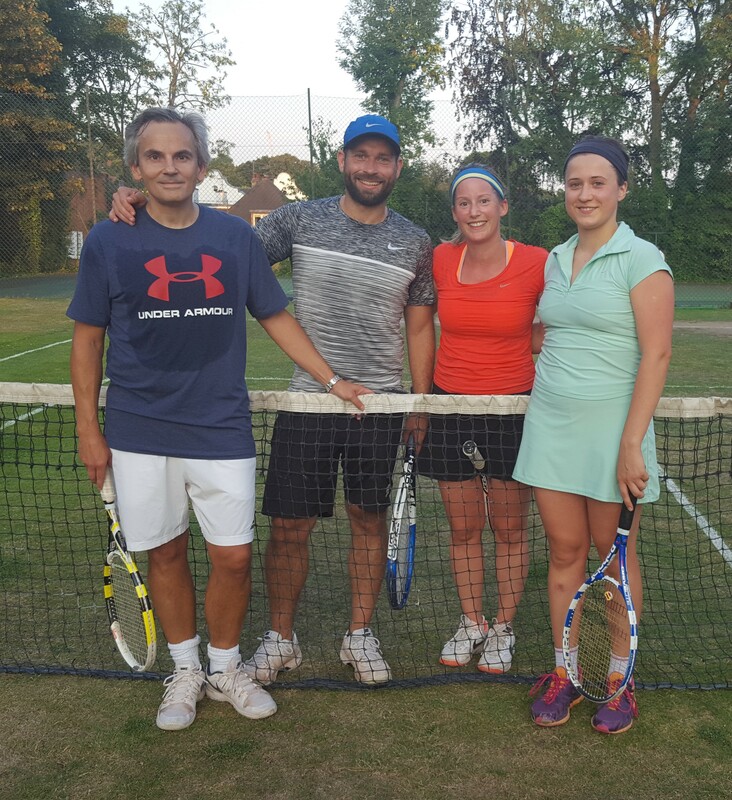 Following the conclusion of the singles on centre court there was a mixed semi-final, the fourth seeds, Carine Valarche & Cedric de la Chaise, played the 2017 champions and top seeds Anais Reding and Tim Simpson. 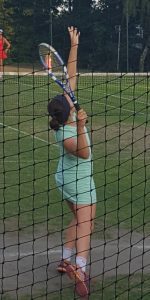 Having asked Cedric to play with her, Carine, given she had missed a lot of the summer tennis season, had been concerned to ensure she pulled her weight in these matches, and had had training sessions for the last few days with Peter Davies (once) and Dhananjay Talwar (twice). Meanwhile Anais was supported by the full contingent of her family, including husband Tom, and 4 month old sons Archie and Charlie, one of whom gently reminded her from time to time that he was around. 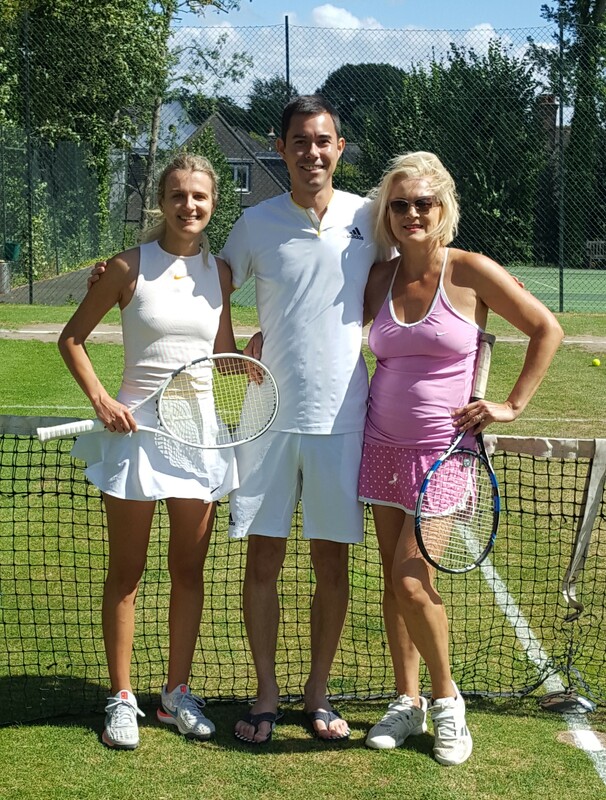 Anais and Tim did not play as well as they did during the 2017 tournament. Anais and Carine struggled to hold their serves as it was tricky to serve into the sun from the far end, particularly on the deuce court. Cedric gave a number of instructions to Carine to “leave” which mainly meant leaving the ball to him, though on one occasion it meant both of them watching a looped topspin shot from the opponents landing at least 3 feet in for an outright winneer. However, Carine rightly tended to ignore such shouts from Cedric if she felt the ball was hers and she could deal with it. She got a number of looks from Cedric which seemed to say something like, “OK I know I told you to leave it and you didn’t, but I wasn’t really expecting you to be able to either hit a winner from it or to hit a shot good enough to set me up to hit the winner on our next shot.” Another difference between the pairs was that Carine, though making the occasional mistake, was able to provide some solid volleys on Cedric’s serve and some good returns on Tim’s serve, enabling Cedric to rush around the court to try to hit winners off as much as possible, mostly consistently. 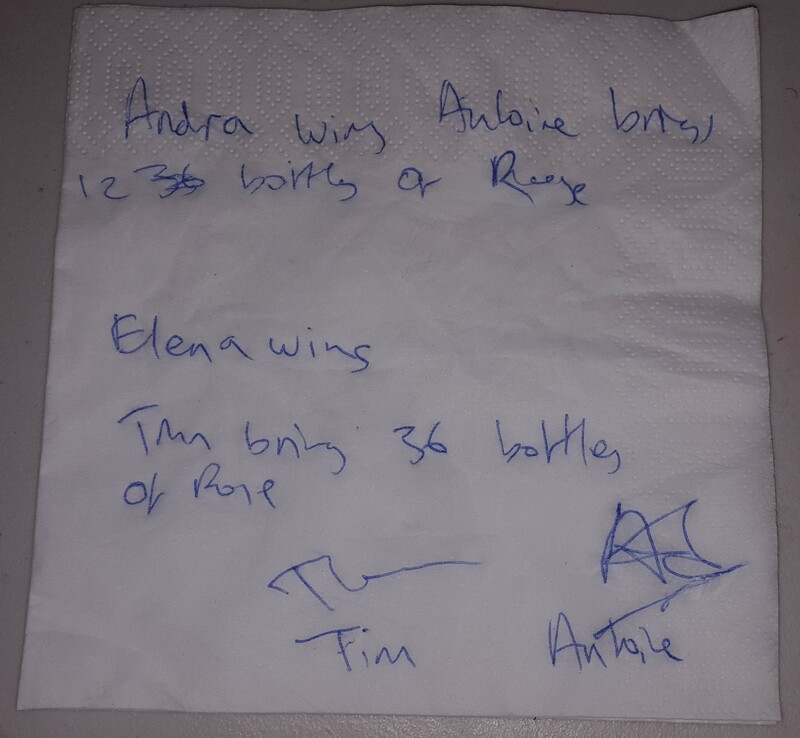 Both sets went a similar way, with Tim and Anais getting to 2-5 down, but losing the last game. Cedric and Carine won the match 6-2 6-2 to earn themselves a place in Thursday’s final. 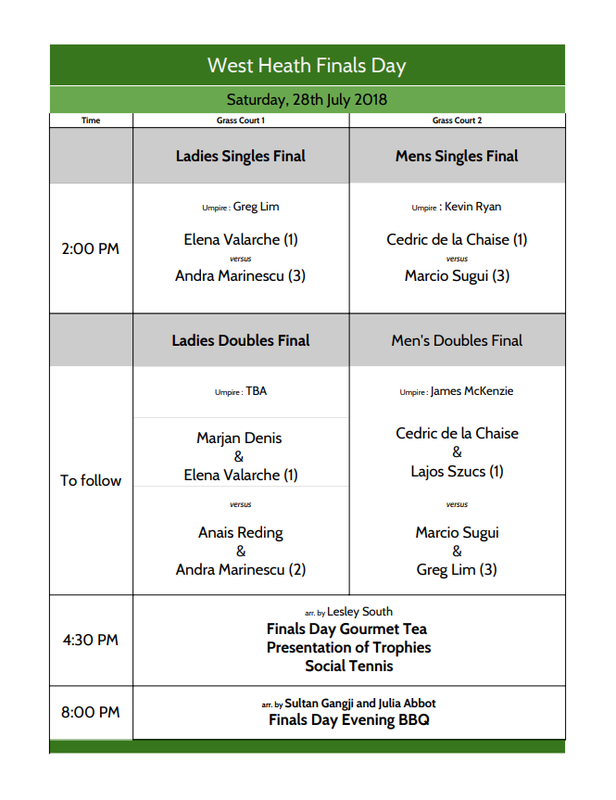 It seems that the other semi-final will not take place, and Greg Lim and Marjan Denis, the second seeds, will play Cedric and Carine in the final on Thursday, as a result of a walk-over. Oh, and the smooth progress of Philip Reid, the fifth seed, might be interrupted at the semi-final, as he might actually have to play a match instead of progressing by means of a series of byes and walk-overs! This evening’s Gourmet Dinner was a tasty Mousaka, cooked by Julia Abbot, followed by creme caramel accompanied by cherries from Jill Elek. 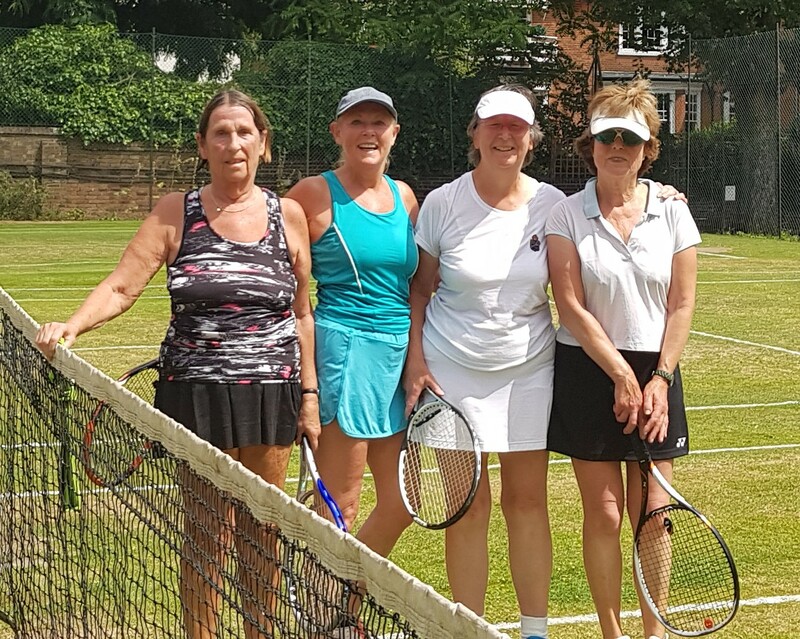 There was an early ladies’ doubles match, kindly rearranged from Sunday lunchtime to allow the mixed doubles draw to proceed smoothly to the Thursday final. 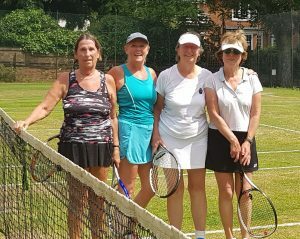 Sally Tornow and Lesley South took on the third seeds, Barbara Thomas & Jane Boyle. The match was very tight. 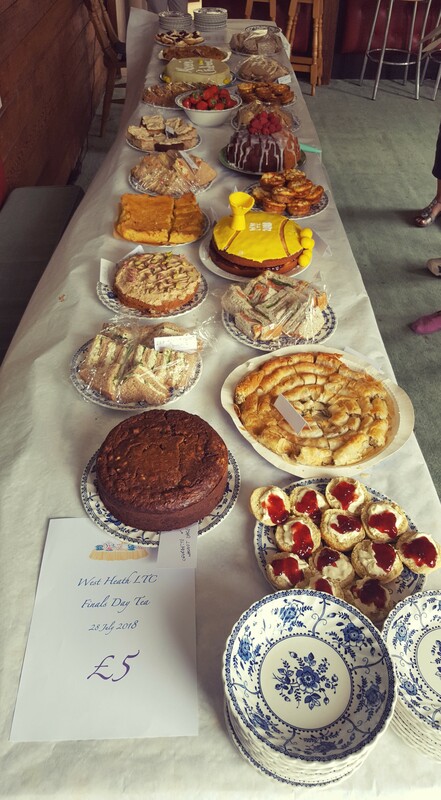 There were errors on both sides, though Sally’s superb volleys and Lesley’s legendary placement may have affected the results, as might Barbara’s extended lunch the previous day. The first set went 6-3 to Lesley and Sally, but the third seeds came back into their own to take the second set 7-5. Everything rested on the champions tie break. Jane and Barbara did not get going in this, allowing Lesley and Sally to run away with it, Lesley and Sally emerging victorious with a 6-3 5-7 [10-4] win. In the evening mixed, Vandana & Dhananjay Talwar played the second seeds, Marjan Denis & Greg Lim (not on babysitting duty this time). From afar it looked like Dhananjay was hitting winners, but with some errors all around. However, appearances must have been deceptive as Marjan and Greg took the first set 6-1. In the second set the seeds were even more in control, registering a 6-1 6-0 win. 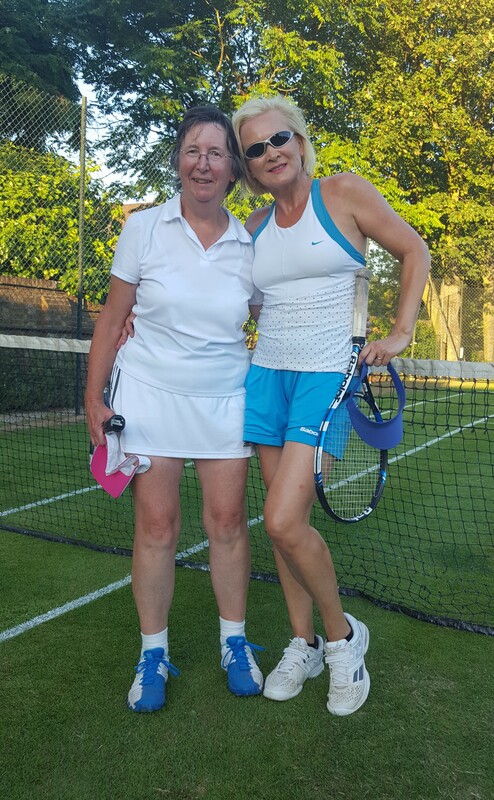 The second close match of the day was in the ladies’ singles between Lesley South and the top seed Elena Valarche. Both contestants were keen to promote the sartorial aspects of the match. Lesley made sure it was common knowledge that she had changed her outfit between the midday match and the evening, a period which also included a visit to Costco with Moira Duncan to stock up with ingredients for Tuesday’s and Wednesday’s Gourmet Dinners. Perhaps one can infer that Elena was feeling confident she would win the match in two sets, because she had brought with her only tennis two outfits – one for the first set and one for the second set. 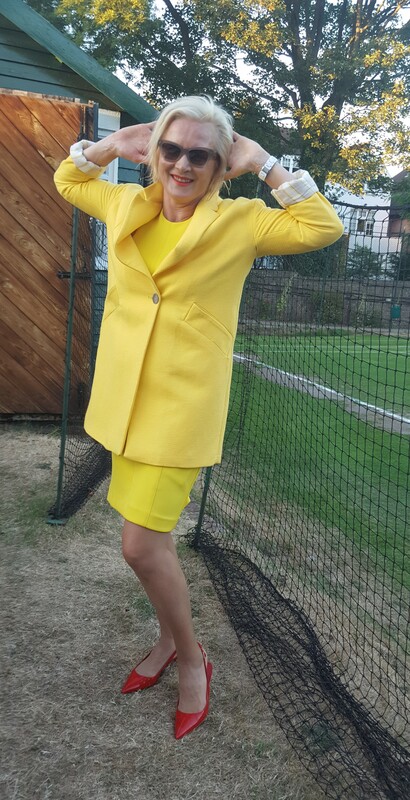 However the first set outfit was not captured on camera, so Elena insisted on a replacement photo of the very yellow dress and coat brought for dinner. 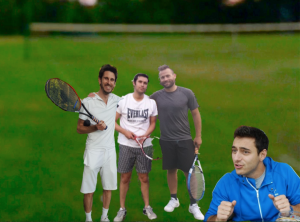 Oh, I nearly forgot, they also played a tennis match. This was a very competitive battle betweens Elena’s aggressive approach and volley play and Lesley’s ability to spot gaps and hit the ball into the angles. Since neither player has a very hard serve, there were a large number of breaks exchanged. Point on Elena’s serve included the occasional ace, but mostly there would be an awkwardly placed return from Lesley causing Elena to come in on a weak approach, often immediately in front of Lesley, followed by Lesley putting the ball into the gap either to the left or the right of Elena to win the point, and usually the game. On Lesley’s serve Elena often found a strong return which gave Lesley little time to line up an accurate placement before Elena was on to it, with Elena managing to hit the winner on her second shot. Elena won the first set 6-4, but in the second set matters got to 5 all before Lesley made one or two uncharacteristic unforced errors in the last two games, allowing Elena to win 6-4 7-5. 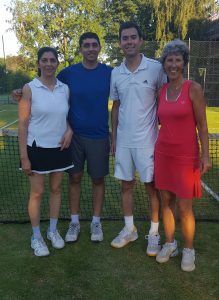 The day kicked off with a mixed doubles match around noon between Barbara Thomas & Peter Davies, and the third seeds Andra Marinescu & Marcio Sugui. In the first set the seeds made a few unforced errors, and Barbara and Peter had opportunities to win somepoints, but were not able to capitalise on most of them, allowing Andra and Marcio to take the first set 6-0. Barbara kicked off the second set by holding her serve, but, unlike their previous round match, her partner and her were not able to up their game enough to make a dent in the dominance of Marcio and Andra, who took the match 6-0 6-1. Early afternoon, in the men’s doubles, Paul O’Flynn & Jasper Tressider played the top seeds Cedric de la Chaise & Lajos Scuzs. Paul and Jasper put up strong resistance in the first set, but lost it 6-4. In the second set the top seeds came more into their own and won the match 6-4 6-2. In the mixed, Sultan Gangji & Moira Duncan played Anais Reding(/Tapper) & Tim Simpson, the top seeds. The match went the way of the men’s doubles above, with a competitive first set won by the top seeds 6-4, and a less even second set giving the top seeds a 6-4 6-2 victory. However, maybe Greg Lim has finally found his true vocation sharing duties with Anais’s husband Tom – encouraging the next generation of tennis players. 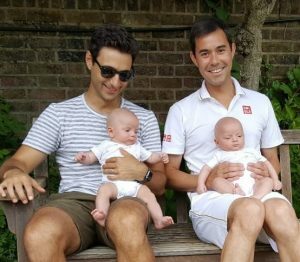 Though currently only 4 months, Charlie and Archie are clearly taking in the finer points of mixed doubles play. In the men’s single, Joseph Rigal played Marcio Sugui, the third seed. After Joseph’s men’s doubles match Sultan had advised Joseph he would get a stronger serve if he threw the ball higher. No-one has come forward to say whether Joseph was able to get a better first serve percentage against Marcio. Marcio won the match 6-1 6-2. My guess would be that a lower error rate and the difficulty of timing the return from Marcio’s sliced left-handed serve would have played a factor in this. 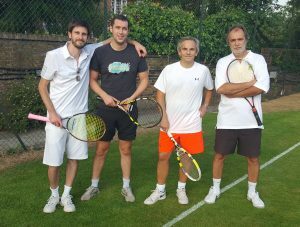 The first match of the day was slated for the grass courts, but after some drizzle, the consensus was to move to the hard courts. 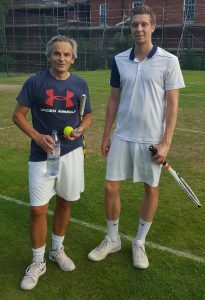 The men’s doubles quarter final between Tim Simpson / Tom Tapper and Ed Fitzgerald / James McKenzie started with a blistering display of serving from Ed with a comfortable hold. A break of Tom’s serve and subsequent holds saw the scoreboard edge to 3-1. The scoreboard ticked relentlessly to 6-1, with James and Ed taking the first set. 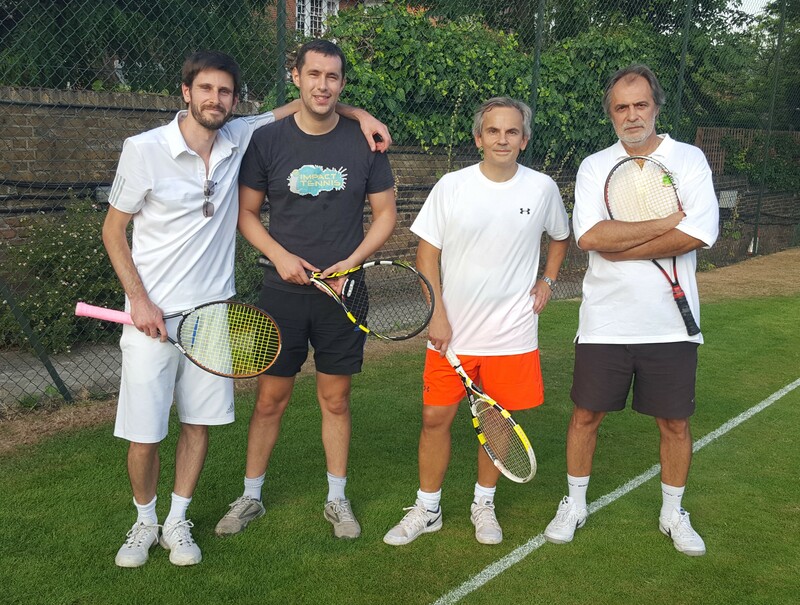 The set was characterised by few errors from James and Ed who managed to hit almost everything back and some audacious lobs by James into the far corner over the onrushing heads of Tim and Tom who often adopted attacking positions at the net. Ed, as ever, decided that power was the answer. And it was. The second set began much the same way, until what James regarded to be the pivotal moment: a broken string at 4-1. Having to play with a different racket, less of the shots were coming off and the scoreline slipped from 5-2 (James serving) to 5-4 with Ed having a chance to serve for the match. At deuce, Tim was all over an easy volley but couldn’t control his follow through. He hit the net and conceded the point despite playing an un-gettable ball-to-court-to-tree combination. Given the opportunity at match point, Ed held his nerve for a solid victory, winning 6-1 6-4. The post-match photo was clearly forgotten about, so a rush job will have to do. But please note, the people are not to scale and the outfits are not coordinated whatsoever. 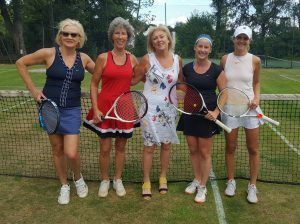 Julia Abbot & Carine Valarche played Carine’s mum Elena Valarche & Marjan Denis, the top seeds, in an early ladies’ doubles semi-final. Elena claimed that she and Marjan played steady tennis. Carine said that the score didn’t properly reflect the chances the chances the unseeded pair had. Certainly the games Carine and Jula got were all on their opponents serve. Although he had witnessed the match, when asked it, Antoine Valarche just volunteered that, when Marjan plays Elena at singles, he felt she should be going for more drop shots. Perhaps this was a wise comment to make in the presence of both wife and elder daughter. Marjan and Elena won 6-1 6-2. The girls would like you to note how colour-coordinated their outfits are!